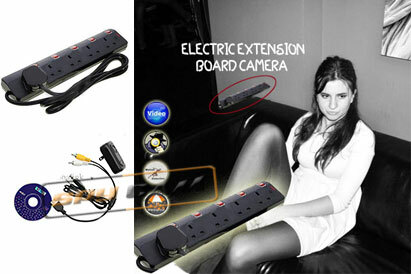 This ELECTRIC EXTENSION BOARD is actually a spy camera. But it has no difference in the appearance from the ordinary ones. The pinhole camera is set in an inconspicuous position, so people can not realize it easily. According to this, the shooting work can be very secret. In order to get good-quality videos, the definition of the hidden camera should be high. This spy cameraâ€™s resolution is up to 1280Ã—720, you can get clear videos even in a moving situation. Long shooting hour is an important thing to a professional spy camera. There is a 16GB memory card built to support the cameraâ€™s working so it can shoot videos continuously a. One of the advantages of this product is its motion detection. If you are interested in this product, please come and enjoy its convenience and its wonderful functions! SPY CAMERA IN ELECTRIC EXTENSION BOARD with a Hidden Camera DVR Built inside 720P 16GB This is a new product of our company. It has good quality and itâ€™s very practical. you can use in rooms/office/bathroom/reception/kitchen etc. 1.Tiny size of the pinhole camera makes it for a variety of uses. 2.It\'s perfect to use it as a hidden camera, spy camera, etc. 3.Continuous recording or motion detection recording until memory is full. 5.Internal rechargeable battery option is available on request. 7.To play back videos on the computer can get the best quality. Copyright © 2013. Action India Home Products All Rights Reserved.